So today I went to a fishing spot for the fifth time. I was introduced to this spot by my fishing mentor and have ventured back as often as possible as it is isolated, beautiful and it has hungry fish- all the things I look for in a beloved fishing spot. It is the kind of spot you don’t readily share. It is sacred. This spot is a large pool on a river. The flow of the river is divided by a pile of rocks and trees into two streams. These merge into a large deep pool and the river continues on the far side of the pool. The setting is such that it is difficult to fish this section from the banks. The depths that hold fish are just out of reach for the bank angler on the trail side and the terrain is very challenging on the far side if you can safely cross over to it. We choose to hike our float tubes down the trail and float between the two streams of water, accessing the entire depths of the pool. We often fish without seeing another person. I have never seen anyone else float this section. I have always done well at this spot and as a newer angler, this is gold for me. I have never landed fewer than 8 fish in a few hours of fishing. I always have fun here. I always feeling connected to the place. It is beautiful- filled with birds, trees, rocks, insects, water flowing and a million details that change just enough to keep me aware of my surroundings- always alert yet relaxed. My favorite thing to do is to kick myself into the current at the top of the pool and ride my float tube down the current and cast towards the end of the pool. Most times the flow spins me around in my float tube like an amusement park ride and I cast whatever direction I happen to be heading towards at the end. I pop out of the current into the central eddy and it floats me back to the beginning of the ride for another go around. 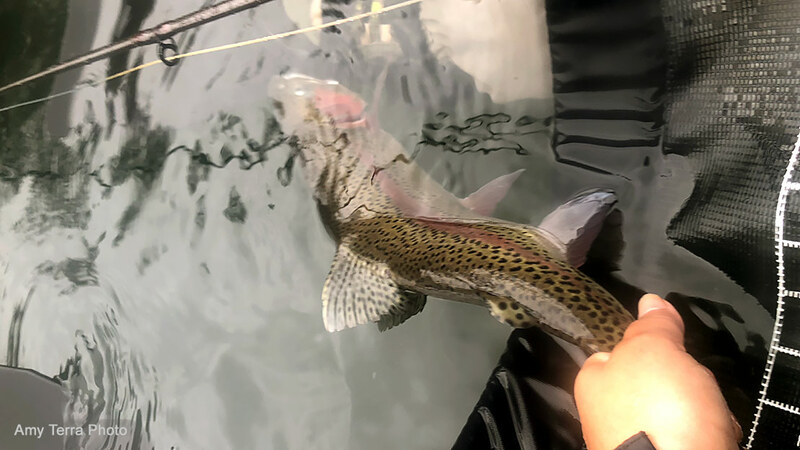 As I head effortlessly upriver, I strip my streamer in fast or slow depending on my mood and often feel that amazing tug of a fish on my line. It is magical and I love it there. Today my experience reached an entirely different level. Today I was floating and spinning and casting like a kid. It was raining off and on. I had the river to myself except for the birds and bugs and fish that joined me. I was catching bigger fish than usual today. Usually my fish range from 6 to 12 inches. Today I was spending more time floating at the tail-out section of the pool. Fish were jumping around me like popcorn- leaping like dolphins. I kicked myself for not bringing a rod with floating line but kept fishing deep with my sinking line. I landed a 12-inch fish. Then I landed a 13-inch fish. Then a 15-inch and then a 16-inch fish. Could this day get any better? I mean really... could it? I breathed deeply and savored the moment. The smells of the river and the smell of fish filled my lungs. I cast as the rain picked up. A fish jumped to my left, catching my eye just as I felt a firm tug on my line. I set the hook and the fish dove deep. Sensing that this was different than my previous catches, I quickly put the fish on the reel and we played our game- no, we danced our dance. He would take. I would give. I would reel line in and he would follow... to a point. Then he would dive and I would give again. Over and over this happened. He finally came to the surface and I had a glimpse of his size. He was over 20 inches easy. Down he dove. When he resurfaced I saw his hook jaw, thickness and the adipose fin. He was clearly a steelhead but more than that, he was a wild steelhead. I have massive respect for steelhead. They have carved an evolutionary path that requires amazing survival skills as they move from inland river to the ocean and oftentimes back again. Each environment replete with numerous predators. So many miles travelled. Obstacles overcome. Paths navigated. So much distance and time and then there we were- in the same space at the same time in this pool on this river. Me with my little rod and fly and line and him looking for something to eat. What are the odds of that? How many things had to align in each of our existences to bring us to this very spot at the same time? It felt like so many moons had to align, so many choices could have changed our trajectories, so we never would have crossed paths. But here we were, connected by line and hook. I had so much respect for this fish that I felt badly when he folded into my much too small trout net. I unhooked him and took a quick picture. He exceeded the ruler on my stripping basket but had to be 20 plus inches. As I released him, his thick body began to move side to side. It was easy to feel the strength and power that brought him to this place of our meeting on his long journey and brought me my first wild steelhead on the fly.